Construction terms and phrases differ significantly across the country, for example, Midwest contractors may call siding – plank. Northeast contractors may call siding – clapboard. A phrase unique to the southeast is boxing. Boxing refers to the combination of the soffit and fascia. Soffit- The underside of an architectural feature, as a beam, arch, ceiling, vault, or cornice. Fascia- Wooden board or other flat pieces of material such as that covering the ends of rafters. The boxing of a home is the most overlooked portion of a siding replacement project. That being said, it is not required that a homeowner replaces the soffit and fascia during new siding installation. About 30 percent of homeowners decide to keep their existing boxing on their home when replacing their house siding. Another option is to paint your existing soffit and fascia which may require wood rot repair. However, this option is only available to homeowners who have hardboard boxing. Vinyl should never be painted as this will void the manufacturer’s warranty and result in peeling or flaking in less than a year. In terms of replacing boxing, there are two options that Carolina homeowners choose over any other. 1) Vinyl soffit and aluminum fascia- Under this installation practice, your current soffit will be removed, or vinyl soffit will be installed on top depending on the construction of your home. Your homes existing fascia will not be replaced. Instead, we will wrap your existing fascia in color matched aluminum. The significant advantages of this process is for cost-effectiveness compared to Hardie. The downsides are aesthetics, durability, color alignment. 2) Hardie soffit and fascia-Under this project option your homes current soffit and fascia will be removed, and new Hardie soffit and fascia will be installed. For the fascia, Hardie trim will be used. 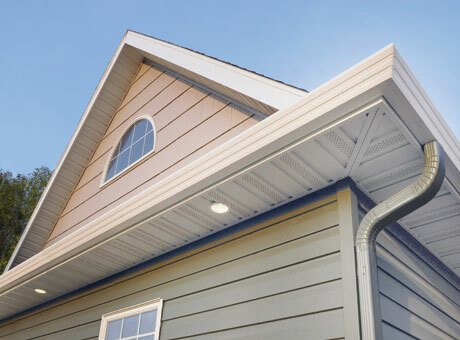 Hardie soffit comes in a variety of sizes, looks, and colors. It is also offered with or without vents for air flow. Your homes boxing may require ventilation. This will be determined by the Hatch Homes installation manager before the project kicks off. Interested in having your boxing inspected on your Carolina home? Hatch Homes would be happy to send out a member of our team to examine the specific areas for you. Call us today, to schedule your inspection.